"You make a living out of giving dumb comments? Pain evolved so creatures wouldn't hurt themselves more by not feeling they're "damaged". Stop dumb commenting!" "...the purpose of the post seemed to be that evolution couldn't explain pain, now as you know pain is covered in evolution as it is a development of the sensory organs and nervous system. I pointed out that it was a poor argument..."
Aside from childish personal attacks and outright misrepresentation (focusing on half of a sentence in my introduction, then claiming that it was the essence of the article, which clearly had not read), they used boilerplate-type responses that had no meaning. They were based on circular reasoning and easily-refuted pragmatism, but the fact remains that atheism and evolutionism cannot answer the deeper questions of human experience. Only biblical Christianity can adequately explain death and suffering as well as the problem of evil. There are people who claim to have been Christians (or theists to some extent) and have renounced God. Quite often, they have had a superficial "conversion experience" and were not rooted in the Word of God and strong teachings. I have had discussions with people (and read comments) who claim to have been Christians for a long time, yet they showed abysmal ignorance of what the Bible really says; so many refuse to do their homework, yet have opinions on subjects that they do not understand. Some use an "argument from outrage", that a loving God could not exist because if he did, he would not allow suffering. But suffering is actually an argument for the existence of God. 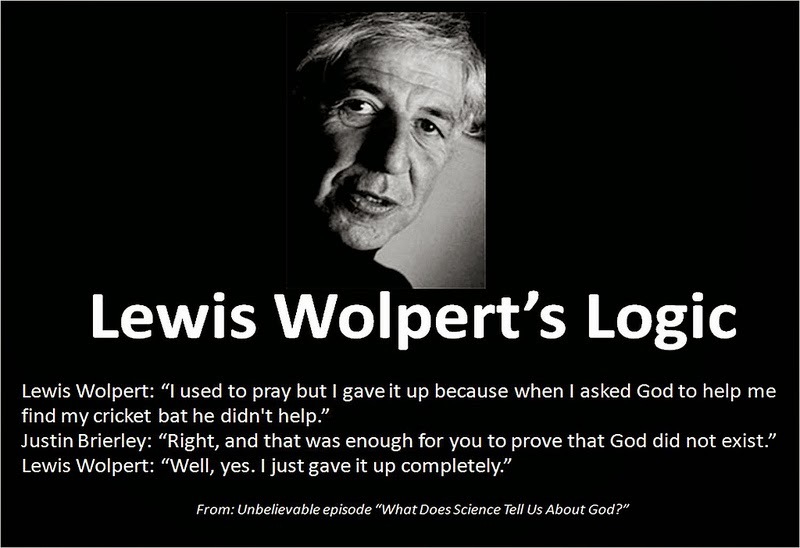 Some, like Lewis Wolpert, want God to become a kind of cosmic wish fairy; if he doesn't do what is asked of him, then he doesn't exist. (Yeah, makes sense to me, too. I believe people like this were looking for excuses to rebel against God.) Some have had deeper problems and said, in essence, "God wasn't there when I needed him and didn't answer my prayers", then they proceed to hate him, pretend he doesn't exist and attack those of us who proclaim the authority of Scripture. Naturally, most people will ask where God is during bad times. But we need to remember that he is our creator (Romans 9.20-21, John 1.3), does things according to his purpose (Ephesians 1.11-12), does not consult with us first (Job 38.4) and has more wisdom than we do (Isaiah 55.9). 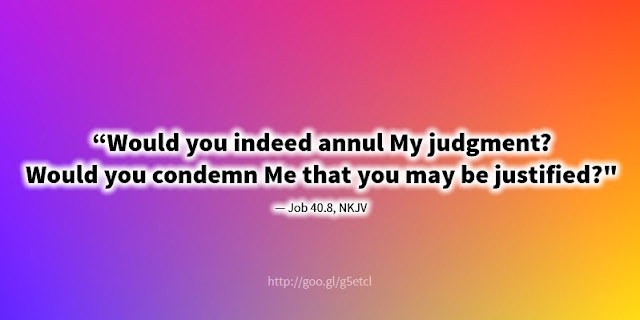 Pretending that God is evil to justify rebellion against him is both arrogant and absurd (Job 40.8). His children need to trust and cling to him (Galatians 4.6), knowing that his judgments are true and righteous (Psalm 19.9). While there are some people who use evil in the world, their own disappointment in God and other things as reasons to rebel against God, there are many others who stay firm in the faith. The article for which I had written an introduction was about one of the most tragic and painful things that can happen to a woman — my friend had a miscarriage. Another friend was feeling the pain of a failed marriage when his divorce became final. Christian singer Jeremy Camp's wife died at age 21, they had only been married four and a half months. Despite tragedy and trials, people still believe. I have been up front about the fact that I fell away from the faith for about fifteen years. (No, I did not "lose my salvation" and get "re-saved" or "re-born-again", loss of salvation is a false teaching.) This was not from anger at or disappointment in God. There were several reasons (written elsewhere), but mostly because I wanted to pursue the sin in my life. Some of my relatives hate me. Abandoned, and even betrayed, by friends. Atheopaths attack both my ministry and me personally (John 15.18-19). My mother died from a malignant glioma. My oldest brother had Down Syndrome and died at age 64. My father had dementia and several other conditions before he died. I've had to deal with several medical issues, past and present. A proper understanding of the Scriptures, patience and respect for God helps keep the apostasy away. Also, plenty of prayer, sometimes Christian counseling and talking to someone who cares is very helpful. There are people I love and want to help, but they are on the other side of the planet. But when I know what's happening, I can pray for them and offer encouragement. It's up to each of us to draw closer to God and persevere. God is there, and he is listening. We still believe. What Are You Putting In Your Head?